Is cúrsa teanga ilmheán é Gaeilge gan Stró! 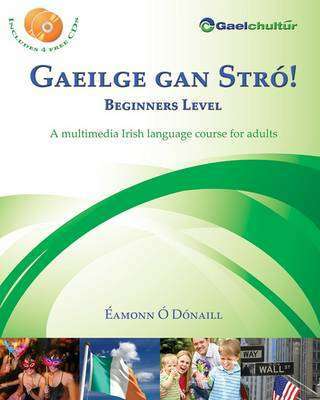 - Beginners Level d'fhoghlaimeoirí fásta. Tá sé oiriúnach do dhaoine nach bhfuil Gaeilge ar bith acu nó nach bhfuil acu ach roinnt abairtí bunúsacha. Tá an bhéim ar fhorbairt scileanna labhartha agus éisteachta ach tá deiseanna ag an bhfoghlaimeoir an teanga a scríobh agus a léamh freisin. Múintear an ghramadach i gcomhthéacs, de réir mar a bhíonn sí ag teastáil. tuiscint a fháil ar ghnéithe bunúsacha den ghramadach na Gaeilge.